We are planning to be fully open with Privates/Phases/Pods & Groups in November! This entry was posted in News & Events on October 18, 2016 by pmaadmin. The school is close(r) to being built out! We’re holding a number of pop-up group classes in October, and a regular schedule will start in November. This entry was posted in News & Events on October 11, 2016 by pmaadmin. We’ll be starting a ‘semi-regular’ group schedule next week, with privates/phases to start in November! This entry was posted in News & Events on October 6, 2016 by pmaadmin. Saturday @Noon- Open Sparring (then handball/hockey). This entry was posted in News & Events on September 20, 2016 by pmaadmin. Hi PMA, Again this Sat & Sun we’ll be working on the new school from 9-4 both days (for the last weekend, classes start next Thurs & Sat). If you’d like to help, we’d love to have your help. Stay tuned for next week group schedule, featuring Mr. Villanueva, Ms. Glaze, kids classes & Sat group & sparring! This entry was posted in News & Events on September 15, 2016 by pmaadmin. We are starting to put together a group schedule for the remainder of September, with regular private lessons and group classes starting in October, assuming everything goes as planned. This entry was posted in News & Events on September 8, 2016 by pmaadmin. We still have lots of work to do to get the space ready to open. Meanwhile, please celebrate with us by coming by for a PMA Play Day on Saturday Sept. 3 from noon to 3:00 p.m. We’ll get some activities going with sparring, soccer, hockey, handball, dodge ball and more. Spread the word…. 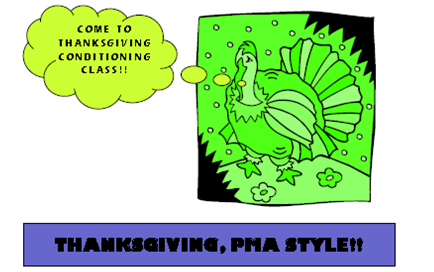 and stay tuned for future updates about a PMA Work Day and class schedules! This entry was posted in News & Events on September 1, 2016 by pmaadmin. This entry was posted in News & Events on November 16, 2014 by pmaadmin. Come learn effective self-defense techniques in a supportive, encouraging and FUN environment! 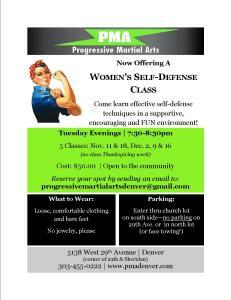 This entry was posted in News & Events and tagged women's self defense class on November 1, 2014 by pmaadmin.